The Fusion Hybrid has many safety features on call, but some important ones--like a rearview camera--are part of an optional Technology Package. That raises the real-world base price closer to $30,000. The arrival of the 2013 Ford Fusion Hybrid continues the company's full-court press to produce ever higher fuel economy figures. 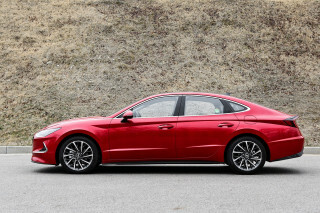 The mid-size sedan bristles with cinematic good looks, confident road manners, and it initially came with big, big fuel-economy numbers. Almost two years later, however, the numbers have been cut down to size in the face of legions of unhappy owners whose real-world mileage hasn't been even close to the EPA ratings. Ford paved its own way with the first Fusion Hybrid, which earned 41/36-mpg gas mileage and represented the first real challenge to Toyota's dominance in the hybrid universe. 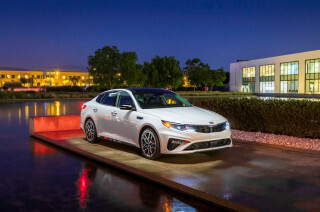 It set the stage for hybrids from Hyundai and Kia, which in turn have set into motion the next generation of hybrids and plug-in hybrids including not only this Fusion Hybrid, but a plug-in Energi version to come soon. Like other automakers, Ford is paring down the new Fusion's powertrain lineups, at least in cylinder count. The V-6s are gone. Only a foursome of four-cylinders remain: one is normally aspirated; two have turbocharging and direct injection; and one sports a completely revamped hybrid drivetrain. In the gas-only Fusions, the highest fuel-efficiency reading is 37 miles per gallon on the highway cycle. UPDATE: While the 2013 Ford Fusion Hybrid was originally rated at 47 mpg combined (47 mpg city, 47 mpg highway), in June 2014 Ford lowered the ratings to 42 mpg combined (44 mpg city, 41 mpg highway) after discovering errors in lab-test measurements and calculations for aerodynamic drag. Ford agreed with the EPA to lower the ratings and send a check for the increased gasoline costs to all owners of 2013 Fusion Hybrids, along with five other cars whose ratings were reduced at the same time. How does it get there? The Fusion Hybrid tops the outgoing model's 41/36-mpg ratings with a smaller-displacement, 2.0-liter four-cylinder engine teamed with batteries and motors for a net 188 horsepower, teamed to an electronic continuously variable transmission (eCVT) to power the Fusion's front wheels. It's similar in concept to the outgoing model, but despite the downsizing of the gas engine, the Fusion not only gets better gas mileage, it also can run on electric power alone at speeds of up to 62 mph, 15 mph higher than before. Some of that credit goes to a switch from nickel-metal hydride batteries to lithium-ion batteries, which store more energy in a smaller space. The Fusion Hybrid's batteries sit in a raised hump behind the rear seats, consuming 4 cubic feet of trunk space, but leaving 12 cubic feet for storage--and significantly, mounting low enough to enable engineers to retain fold-down rear seats and a useful pass-through to the cabin. Ford flew us to Los Angeles to drive the new Fusion Hybrid, and set us up with a limited drive of about 15 miles in early production models. In that very short drive, we didn't come close to observing 47 mpg. But not to worry--we registered 36 mpg, without really trying, as we pressed the Fusion Hybrid to see how well its drivetrain performed compared to its gas-only relatives. What we found was that the former Fusion Hybrid's very smooth integration is a trait that's been passed down to the new generation. The isolation of the gas engine is good, and noise levels even at full throttle are generally low, thanks in part to active noise cancellation, which factors out some sounds with counteracting sounds (ask Mr. Wizard--it works). The transition from electric to gas-electric power is seamless, and the Fusion Hybrid's regenerative braking feel has been softened to something closer to normal, with a less noticeable transition from motor braking to conventional braking. The first Fusion Hybrid gave little notice that you were driving a combination of two powertrains; this one almost keeps it a state secret. Aside from its powertrain differences, the 3600-pound Fusion Hybrid shares its independent suspension and electric power steering with the other models in the lineup, with its own tuning. In our brief drive, we liked the Fusion Hybrid's steering feel; it's without the artificial stiffness we've found in systems from other hybrid automakers, and without the lifelessness, too. Still, it seemed to take quite a bit of steering angle to direct the Fusion through ordinary turns. The low-rolling-resistance tires were quiet on the go; the Hybrid's suspension tuning is firm but forgiving on most surfaces, but over a few deep bumps, it transmitted a thud or two from underdamped wheel movement. The Fusion Hybrid's svelte body looks dashing, though not so much in the frosty trendy greens that underscore its planet-saving mission. It's a descendant of Ford's Evos concept, and a hollaback at the Audi A7, and it's an utter success from every angle, right down to the Aston-knockoff nose. 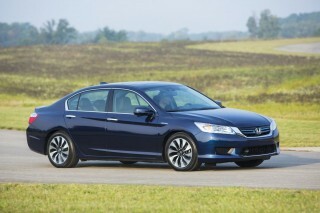 Go ahead, try to find a better-looking family sedan at the price. Even the cockpit improves on the Focus and Fiesta, with a very clear imperative to simplify and pare down the confusion of buttons that can rule those cars and their dashes. With the Fusion Hybrid, the adoption of an LCD touchscreen and MyFord Touch's voice, wheel, and touch controls--and redundant, capacitive controls for climate and radio functions--have reduced the vitals to an elegant panel of essentials with a minimum of breaks in the surface. It's quite striking, especially when considered against the similarly sized Volvo S60, a clear influence, down to the open storage space that lies ahead of the shifter, and under the center stack. The Fusion Hybrid has interior room that's about the same as the outgoing model, reorganized a bit to accommodate the sleek roofline. Without a sunroof installed, there's very good headroom, even in the back seat, and four six-foot adults can sit with ample knee room, though the front passenger's feet will be canted slightly inward, around the wheel well. The Hybrid's base seats are covered in recycled material; it's shiny in an environmentally pleasing but inexpensive-looking way, but the seats themselves are shaped very well, with thin but supportive cushions and headrests that don't push too far forward as in some recent Fords. The 2013 Fusion has eight airbags standard--front, side, and knee bags for front-seat passengers, and side curtains that cover the entire window opening front and rear--for all four outboard passengers. Ford is aiming for five-star safety ratings from the NHTSA; the IIHS calls it a Top Safety Pick. 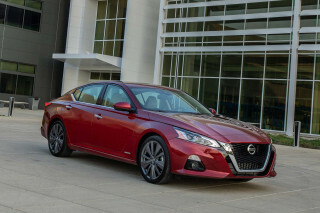 Bluetooth is standard on the Hybrid, while a rearview camera, parking sensors, adaptive cruise control, blind-spot monitors, and lane-departure and lane-keeping assist are options. So is active park assist, which steers the car into a parallel parking space while the driver controls the brake and throttle. Other features offered include a navigation system; a rear spoiler and 18-inch wheels; leather seats; a sunroof; remote start; parking sensors; and a technology package with the rearview camera and an 8-inch LCD screen for MyFord Touch. The 2013 Fusion Hybrid arrives at dealerships this fall, priced from $27,995, and immediately positions itself as the most desirable hybrid on the market short of the Fisker Karma. 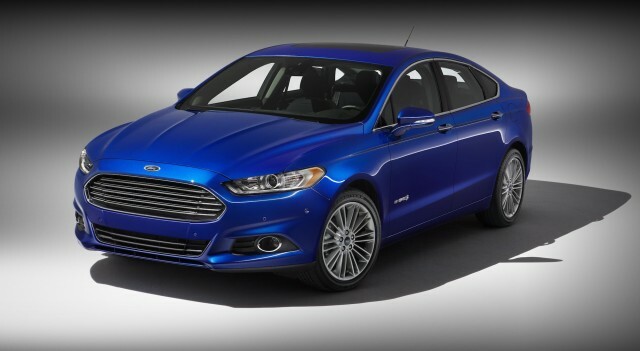 The 2013 Fusion Energi, which arrives by the end of the year, is the plug-in companion to the Hybrid. It gets a larger lithium-ion battery pack, a 3.3-kilowatt charger, and an external door for the charging port. Few details have been revealed other than the Fusion Energi's efficiency rating, which Ford predicts will settle in at above 100 MPGe--above the Prius Plug-In Hybrid, and higher than the Chevrolet Volt. UPDATE: While the 2013 Ford Fusion Energi was originally rated at 43 mpg combined (100 MPGe efficiency, 21 miles electric range), in June 2014 Ford lowered the ratings to 38 mpg combined (88 MPGe efficiency, 19 miles electric range) after discovering errors in lab-test measurements and calculations for aerodynamic drag. As it had done with the Fusion Hybrid, the EPA allowed Ford to lower its ratings and compensate owners for the presumably higher gasoline costs. We'll update this review with more on both models as we get more seat time. For more on the gas-only version of this sedan, see our review of the 2013 Ford Fusion. Overall the Ford Fusion Hybrid is a great car. It is very comfortable. I got mine fully loaded and love the adaptive cruise control. I feel that it should stay in electric mode more than it does though. I love just about everything withmy Fusion hybrid. I have 47.9mpg lifetime driving (40k miles) more rural roads (avg 45mph) than highway. The interior is very comfortable and the electric seats are great in... I love just about everything withmy Fusion hybrid. I have 47.9mpg lifetime driving (40k miles) more rural roads (avg 45mph) than highway. The interior is very comfortable and the electric seats are great in the winter. I have the remote start feature which works very well at a distance (~75-100 yards) from my office. While the latest update to myfordsync works fine it still has a few minor software glitches related to playing music from my iPhone. The navigation system is very good and the estimated arrival time very accurate. I recieve the Sirius XM traffic updates which compliment the Nav system well. For a hybrid performance is very good. Step on the gas when you need it and you go. It isn't a Mustang but it certainly can get you into busy traffic if needed. The transmission is very smooth to the point you don't even notice shifting. I was a luxury car owner. My previous 2 cars were a Jaguar and a Mercedes. Loved both cars but the Mercedes was much too expensive to maintain and repair. But my 2013 Fusion Hybrid beats then both. This car... I was a luxury car owner. My previous 2 cars were a Jaguar and a Mercedes. Loved both cars but the Mercedes was much too expensive to maintain and repair. But my 2013 Fusion Hybrid beats then both. This car has the same amenities as the luxuries, rides and handles just as well, is quieter on the road and blows them away on mileage. After a little over 33,000 miles I am averaging 50 MPG and can reach 70 MPG on some individual trips. 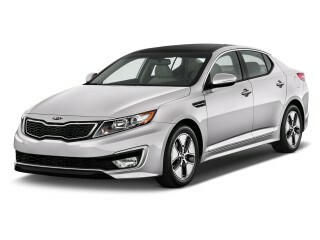 In addition, this is not some weird looking typical hybrid going down the road (I'm looking at you Prius). It has awesome styling reminiscent of Aston Martins, and is roomy and comfortable in both front and back seats. And since the rear seats fold down flat, the hybrid battery pack is not as space consuming as in most hybrids. If there is a downside, it's the pick up either from a full stop or accelerating while moving is not as robust as a non-hybrid. But 50 MPG more than makes up for that. 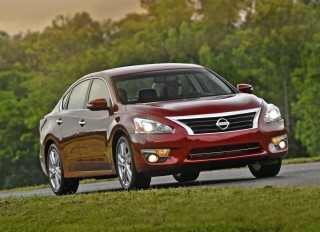 We got this car primarily for my wife, and it has far surpassed all our expectations based on "professional" reviews. I didn't realistically expect to get close to the estimated MPG ratings - wife has a lead... We got this car primarily for my wife, and it has far surpassed all our expectations based on "professional" reviews. I didn't realistically expect to get close to the estimated MPG ratings - wife has a lead foot - but after 21,000 miles (about 60/40 highway/town driving) we are averaging 40.6 mpg, and I'm delighted with anything over 40 mpg. We have been accustomed to driving slightly smaller cars (older model Toyota Corollas an Camrys), so there was a little apprehension on my wife's part of driving a "larger" car. No worries whatsoever. Handling is great, cornering is very precise - the Fusion goes where you point it - and the ride and comfort are superb. No one is going to mistake the acceleration and performance for that of a sports car, but that's okay because it's not meant to be a sports car. It has more than enough power to handle practically any everyday driving situation, the braking is excellent, and we always feel safe, even in high crosswinds or torrential rains. One of our first trips was going to a niece's wedding up in Portland (driving from Los Angeles area) with in-laws and a loaded-to-the-gills trunk, and our in-laws, as well as us, could hardly believe how smooth and quiet and comfortable it was the entire way. We have yet to find a single thing wrong with the fit and finish. Warnings about difficulties in using the touch-screen infotainment system proved false (works like a charm for us). All-in-all, zero complaints, nothing but satisfaction, and thinking we are going to be driving and enjoying this car for a long time to come. Best car I've ever owned, and the most fun! I've owned a lot of cars almost all of them very good for their segment, but none better than our Fusion Titanium Hybrid. I've downgraded it on fuel economy only because we didn't get what Ford originally... I've owned a lot of cars almost all of them very good for their segment, but none better than our Fusion Titanium Hybrid. I've downgraded it on fuel economy only because we didn't get what Ford originally suggested (for which we've received a mea culpa check). But we never expected we would and we think the 40 mpg over 31k miles to be excellent especially since close to half of the miles were on 75 mph freeways, heavily loaded. The two things I like best are (1) comfort. Before the Fusion we had three Volvos and I thought I'd never have a better car. We left Volvo because of their ill-advised move to thirsty six cylinder engines, and thought that those marvelously comfy seats were a thing of the past. Not so. Our Fusion's are even better and believe me I never thought I'd be saying that! Fit and finish are first rate, too--almost at luxury car levels. Looking for a different year of the Ford Fusion Hybrid?